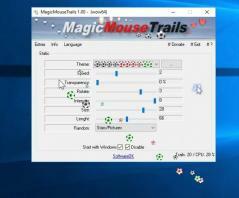 MagicMouseTrails is a nifty little program with the sole purpose of making your desktop experience better. The application leaves a trail of symbols behind your mouse cursor, making it look better and more visible. The application consumes little to no resources, it's very lightweight and easy to install. MagicMouseTrails features a sleuth of symbols to choose from, from stars and hearts to balloons and flowers, you have a variety of choices. All effect trails can be further customized by adding different levels of transparency, intensity or rotation. All in all, MagicMouseTrails is a nice program that can make your mouse cursor more visible by beautifying its looks and functions. The software is free and has little impact to your resources, we suggest giving it a try.